A few weeks ago I showed some of my work on PITCHf/x data correction, particularly on adjusting location values. Since then I have worked on calculating the needed corrections for each parameter (the position, velocity and acceleration vectors) in every game in the PITCHf/x database; right now I can figure the corrections as soon as I upload new games to my PITCHf/x database. While I acknowledge my numbers are not necessarily the best possible estimates, other analysts (Mike Fast in particular) have shown they are at least adequate, and I feel comfortable in applying the corrections I compute rather than using the values as provided. In the past I have always refrained from analyzing release point data, as several PITCHf/x number crunchers have pointed at the pitfalls awaiting those who neglect to take PITCHf/x calibration biases into account (for the n-th time allow me to point you to Mike Fast’s “Internet cried a little” famous piece). Now that I have a way to deal with those biases I can have a first look on the subject. In this article I’m going to just scratch the surface, deferring deeper explorations to future pieces. Before starting let me take the opportunity to thank Jeremy Greenhouse, who kindly shared a bunch of data from his work on release point corrections; I used his numbers as a sanity check for mine. 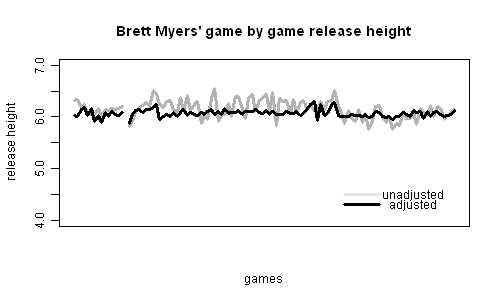 In the image below the average (vertical) release points are charted for Brett Myers’ starts captured by PITCHf/x. The original PITCHf/x values are compared to the adjusted figures. The apparent smaller variation (release height standard deviation is 0.18 for unadjusted values, 0.07 for adjusted values) is good news for the correcting algorithm reputation. In fact, without the adjustments the calibration variability adds to the pitcher’s game-to-game slight inconsistency. The corrections aim at removing the former. Of all the pitchers in the PITCHf/x database, 91 percent see a reduction of their release height game-to-game variation, with the standard deviation shrinking on average by 0.05. 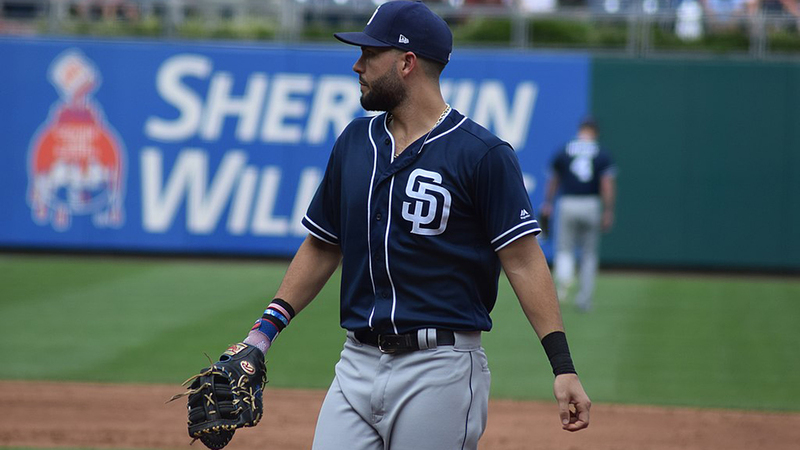 The first focus on release is a quick look at pitchers who lower their arm as the game progresses. Running a correlation between release height and pitch count in the game, the following pitchers emerge as the ones with the highest negative correlation. Let’s take Carl Pavano. 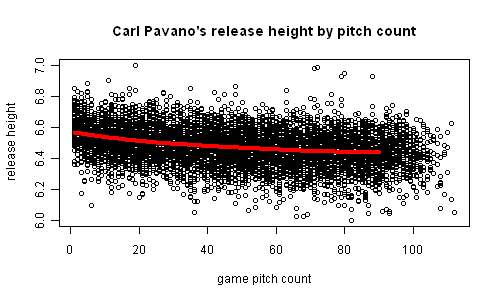 Here’s the scatter plot of his release height against pitch count in the game. The superposed line [loess] shows the trend, which seems roughly linear. Fitting a straight line among Pavano’s pitches we get that he drops his arm about 0.15 inches every 10 pitches in a game. While the result is statistically significant, I wonder if such a small decrease (and we are talking of one of the guys with the highest negative correlation) is somewhat meaningful. While a majority of pitchers slowly drop their arms during the game, a fifth of them show an opposing trend. Below are the 10 pitchers with the highest correlation (i.e.,raising their arm during the game). Focus N. 2 is on Barry Zito. 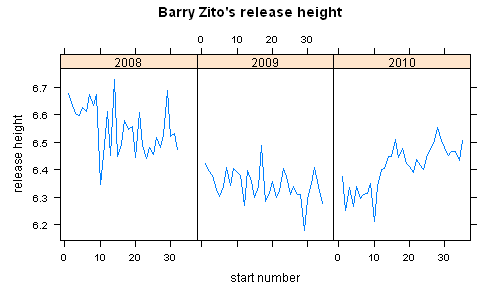 I noted in our last Annual how Zito’s comeback in 2009 was subsequent to (not necessarily caused by) the altering of his release point. His average release height dropped substantially from 2008 (6.55 feet) to 2009 (6.34 feet); in 2010 (6.40 ft) it was a bit higher than in 2009, but still lower than in 2008. Here are all his PITCHf/x starts plotted. Speaking about altered release point, some fuss has recently been made around the web about the Nationals not noticing a Stephen Strasburg’s delivery metamorphosis, which should have been a clear indicator of the prospect’s soon-to-come injury. The above table does not show any noticeable difference in the starts preceding the injury, or in any start for that matter (with the possible exception of his terrific major league debut). It must be said that the alleged alteration might have happened as early as spring training, in which case there are no data available to test the hypothesis. Regarding the possible correlation between injuries and release point, our Kyle Boddy has set up a nice web service containing injury information and game-by-game average release points, which are already adjusted using my correction values. Every now and then we hear teams on the road complaining about mound height. By using a slightly modified multilevel model, I separated the stadium effect from the game-by-game effect on vertical release point. According to my estimates the highest offsets in the PITCHf/x era have been at Fenway Park in Boston on the positive side and at Busch Stadium in St. Louis on the negative side. Even if the estimated offsets can be fully attributed to mound height (which I strongly doubt—the PITCHf/x camera might simply be systematically off in those parks, or the results might simply reflect random occurrences), we would have the highest mound 1.8 inches over the major league average and the lowest one at 1.1 inches under the mean. I defer to professional pitchers for a comment on how a difference of such magnitude can have an effect. The stadium variability for vertical release point is very similar to the one for horizontal release point (for which there should be no groundskeepers effect), thus I would dismiss the case of the Boston hill being higher than it should be. Finally, after having extensively worked on the vertical dimension of release point, let’s briefly explore something x-axis related. While I’m trying to compile a list of pitchers who have the habit of exploiting the full 24 inches of the pitching rubber, here I’m showing the behavior of a couple of them. 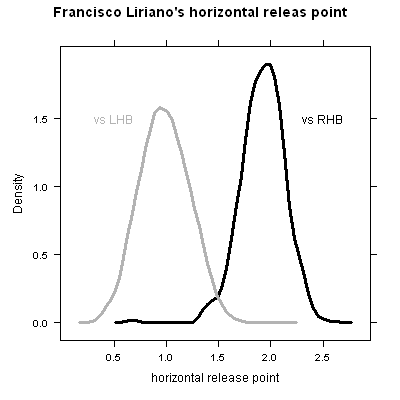 As we see from the plot above, Francisco Liriano moves only to adapt to batter handedness: he delivers from the right end (catcher’s point of view) against right-handed batters and from the left border against southpaws. 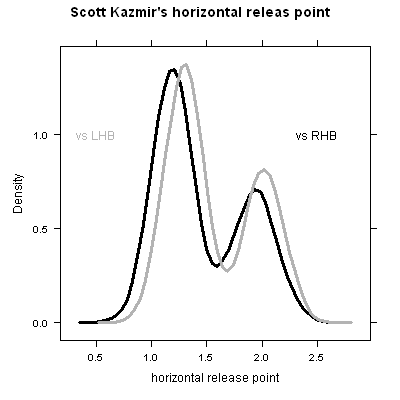 On the contrary Scott Kazmir is a real dancer on the mound; he throws from either side of the rubber both against righties and against lefties. A deeper analysis of the latter kind of pitcher is due (position on the rubber according to count on the batter, pitch selection, etc. ), but as I mentioned at the beginning, this article was meant to be just a first pass on the release point subject. So that’s enough for today. On a per game basis you should try to control for pitch type even though it will come at the expense of sample size. For some pitchers their fastball is used quite heavily early on in the game and off speed pitches begin to be mixed in more heavily towards the end of their outing. Max – One method to see of the mound is higher, is to see if pitch speed is faster in those parks. The higher the mound, the faster a pitcher can throw.